Description - This app is a game that uses speech recognition to activate animations. It is deigned for preschoolers and kids with autism and speech impairments to motivate them to play by voice. Say a color and see what happens - balloons pop, birds fly, dogs play fetch, trains go Choo Choo down the track and shapes spin. KIDS FIRST!® Kid Jurors say - The game "Sayin' It Sam" is an amazing interactive game different from any other educational game out there. "Sayin' It Sam" is a game made for preschoolers and, in particular, those who have autism to motivate them to speak. There are different modes that have different colors that you have to name in order to get to the next set of colors. You can chose between popping balloons when you name each color, or naming the colors of different shapes. The artwork for this game sets a warm tone and a kid friendly atmosphere. There isn't a pressuring timer, or a big bad boss level, just Sam encouraging you to name those colors, and use your voice. Unlike some games built around sound, this game has prompt responses to hearing voices, and a variation of responses to each color named correctly. Sayin' It Sam: Colors is an educational app for young children and those with speech disabilities. This app is a good idea that could have been utilized better. The app Is very simple which is a good thing because it's easy to navigate. When you open it, there's a menu. You select choose an item and then you guess the color of the item. The next screen has three items, each a different color. You say one of the colors out loud and it continues to another set of colors. When you get it right, Sam congratulates you. I'm not sure if this is the app's fault, but it didn't understand anything I said. It might be because of my accent (I'm Irish), but I couldn't get past the first set of colors. The animation is good for such a simple app and Sam's movement is smooth and his mouth mostly matches the audio. The colors are a bit confusing, because brown looks like red and purple looks like pink. I give this app 3.5 out of 5 stars and recommend it to ages 3 through 6. Sayin' It Sam: Colors, is an app where you name the colors of shapes, balloons and other objects. When you click on a game to play, Sam says "Let's play!" After the objects appear he says, "Say a color." Then, you say a color and, if you said the name of the correct color, it does a special animation (different for each level) and the shape disappears. Sometimes it takes 4, 5 or even more tries to get the shape to vanish. This game is designed to give young kids who are still learning to talk and kids with language impairments a chance to practice speaking. The animation is quite good. 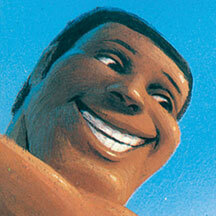 For example, the character Sam, instead of being a random monster or talking animal is a realistic animated human. I like that. I rate this app 3 out of 5 stars and recommend it for ages 3 to 6, because it teaches speech and yet it doesn't seem to recognize older voices. I think it's a great idea, but I wish it recognized what I said more easily. I have an Irish accent so that might have been the problem. Some kids might get frustrated having to repeat themselves so many times. The app also has a website (http://www.sayinitsam.com/) which shows live videos of the app being played, a link to their blog and more. Description - My Town: Pets has everything needed to take care of your pet. Play with cats, dogs, birds and hamsters. Imagine adopting your dog, dressing them and discovering all the hidden locations and hot spots. Walk your dog at the park's litter sand area, just don't forget to clean up the poop. Wash your animals and if they get hurt take them to the vet. Discover all the locations and invent your own story with each game play. KIDS FIRST!® Adult Jurors say - This app is age appropriate and cute. I watched my 8 year old play with it and she was completely drawn in. The images are well done. The topics covered perfect for anyone thinking about adopting a pet. You can do a dry run by using the app to see if your child is really all that interested in taking care of one. My only objection is that there is very little diversity shown. I was quite surprised by that since the company is an Israeli one. I give it 3.5 out of 5 stars and recommend it for ages 5 to 8. Reviewed by Julie S., KIDS FIRST! Juror. KIDS FIRST!® Kid Jurors say - This app melted my heart with pets so adorable that I just wanted to wrap them in a bear hug! I'm telling you, this app will instantly captivate you with an overload of cuteness! You are in a town full of pets to adopt! There is also a relaxing spa and fashion boutique for pets. You can feed, play or even weigh your pets! If you want to spice up a pet's appearance, you can take them to the spa and give them a new coat! The options are almost limitless, and you have an infinite supply of dogs, cats, birds and hamsters! My favorite part is that you can buy new outfits for pets and even the townspeople! This app promotes responsibility for pets, even though it's easier in a game. This app is extremely addicting. Watch out, your mother might get upset if you spend all day playing this! I give it 5 out of 5 stars and recommend this game for children ages 4 to 10. You can find this in the App Store for iOS devices and on google play for Android devices, so check it out! Reviewed by Eden T., KIDS FIRST! Film Critic age 8. My Town: Pets is a video game app that's filled with layers of fun. It is mostly about pets, but if you are creative, then this game can expand with your own individual imagination. I think that the possibilities for fun are almost endless! In this game, I am a special person that can control everyone and all the animals too. First you adopt a pet and you can also have your other humans (NPCs) get pets too. After I have my pet, I can play with it, take it for a walk to the park or other places. There's even a groomer and a veterinarian. You can go inside and click on all things to make them move. This game can teach kids how to be a good pet owner. The lessons learned when playing My Town: Pets is that pets are fun but you must care for them. The animation is simple and sweet. I love the sounds in the game. The music is fun and has energy. It is easy to listen to. My favorite sounds in the game have to be the meows of the kittens. They sound so cute! I give My Town: Pets 3.5 out of 5 stars and I recommend it for kids ages 2 to 5. I don't think grown-ups would enjoy playing it, but my mom played it and she loves it. I say you should check it out for yourself! You can download My Town: Pets now in the Apple App store or in Google Play for Android devices. Reviewed by Izzy C., KIDS FIRST! Film Critic, age 9. Description - Small is the New Big! 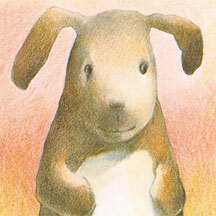 Read, Watch, Play, Create, and Discover with Charlie the Chocolate Chihuahua! It isn't easy being little, but it sure is fun! Charlie the Chocolate Chihuahua is a tiny dog in a big world! Help Charlie find his way in his new home with this engaging, fun, and thoughtful family entertainment that will inspire creativity. KIDS FIRST!® Adult Jurors say - This app offers two major games and a reading comprehension section. Charlie, a Chihuahua, is in his new home and learns to get along with the two other dogs who are already live there as part of the family, as well as relating to other animals including a squirrel and birds though this is quite minimal. A jigsaw puzzle section featuring Charlie in various settings can become quite challenging and represents the most likely part children would return to. It is very bright and colorful, fun to use and has exceptional audio quality. The games are slightly challenging. They use audio reinforcement nicely as one solves the small challenges. However, after a few times playing the games, a child could lose interest as the challenge lacks depth. The navigation could be a bit clearer. To get back to the home page, you have to move your finger (on iPad) to the top left corner to make the icon for Charlie re-appear. In the reading section, you need to swipe up on the bottom to get arrows to direct you back. I found it a bit confusing. In the Reading Comprehensive section, there is conflict between one large dog and a squirrel and the lesson learned seems out of context. The animation is basic but smooth and definitely colorful. The sound is great, very clear and makes use of a variety of voice types. There is little entertainment value but the educational benefits include concentration skills that can be developed with the jigsaw puzzle. The social benefits are minimal as the lessons learned in the reading section are so basic and not always convincing based on the story. Interestingly, it is mentioned that Charlie is a rescued dog. This idea could have been explored further to give more depth to the story. Of course, the reading section itself is helpful for young readers and allows for users to be read to or to read by themselves. I recommend it for ages 5 to 7. REviewed by Michael F., KIDS FIRST! Juror. KIDS FIRST!® Kid Jurors say - A New Home for Charlie the Chocolate Chihuahua is an exciting app that makes use of really cool visuals and sound effects (including voice acting). It is an easy to use app that makes use of colored buttons to assist in navigating it. This app contains a selection of things to do that I think kids between the ages of 5 and 9 would really enjoy, these include stories to read, videos to watch, games to play, and artwork to create. All of these have an emphasis on exploration and creativity. I think that it is a great app for younger children with the only downside being occasional performance issues that I experienced, including lag. There is a ton of variety for kids to enjoy in this app. There are things to read, videos to watch, games to play, and artwork to create. This extensive content for kids to explore is complete with enjoyable graphics, artwork, and animation. I believe a child would enjoy this because it features a loveable cast of dogs (and who doesn't like dogs) that are created using impressive visuals. The user also gets to interact with these dogs in ways that are kid friendly such as games and videos. This app features a simple, but effective user interface that uses colored icons to help navigate. The content is definitely suited to the audience with appropriate vocabulary and concepts. The characters portray characteristics that show positive values of friendship and cooperation. When there is conflict, the characters work together to resolve it. They definitely are uplifting and positive. KIDS FIRST!® Adult Jurors say - This is an intuitive app that is designed to help students, ages 5-12 review and expand upon concepts they learn in school. In my experience with the app, I noticed that it has a well designed user interface that is easy to navigate and is pleasant to look at. There are three subject areas that the app covers: Math, English and Reading. These subjects are covered in sections that each contain questions that will challenge the user to think deeper, to solve problems and to interpret reading. The user can also select the grade level content they wish to work with, making it easy to tailor the experience to individual needs. I believe children will enjoy learning on this app because of its fun style and the fact that it offers rewards for users based on how hard they work. Overall, I believe it is a great example of meeting KIDS FIRST! criteria, but there are a few negatives that I should address. First, I experienced some performance issues, my app was laggy and slow. Secondly, there is not very much sound in the app, which is strange for an app with such a good visual style. Despite those drawbacks, this is a very solid app, which is why I give it 4 stars out of 5. This app has great exercises in the three subject areas I mentioned above, the obvious benefit is that it is a useful tool for elementary and middle school aged kids to review and expand upon what they learn in class. There are lots of tools that track the user's progress and there is a handy level selector that the user uses to pick up where they left off. Users are also allowed to go back and fix mistakes before moving on. KIDS FIRST!® Kid Jurors say - This learning tool is perfect for school-aged kids and I love that it's not boring like a lot of other educational apps I have tried. The main reason for that is the way it awards you digital medals depending on how well you perform. I love getting medals! It made me want to keep playing so I could get more. I wished they used this app in schools. I would look forward to it every day. Parents who prefer only educational games for their kids should definitely check this app out. Smart-EZE has three different categories: math, reading and writing. Each section asks you a series of questions. Sometimes you have multiple choice answers to choose from and sometimes you have to write in your own answer. I like the reading sections best because the stories are all very funny. I had a trickier time with math because, even though I was playing at my grade level, there were some math concepts I had never seen before and didn't understand. It might be a good idea to make sure your kids know that the app covers lots of different materials and concepts and they might not know all of them. It all just depends what they have covered in school. Another part that I like is that you are able to go back and repeat questions that you missed until you get them right. Also, Smart-EZE has a parent mode that allows parents to check on their kid's progress and see how many questions they got right or wrong. The only part that bothered me is that the app seemed a little laggy when I played. This was particularly noticeable when using the note pad and watching animation. I recommend this for kids ages 8 to 12. I rate this app 4 out of 5 stars because it is lots of fun, but the lag is a little frustrating. Description - Create the perfect music and play with tracks in different genres, including dance, pop, and hip hop. Layer your loops and add fun sound effects, then take your beats to the dance party. Your color-coded music creates an exciting color and light show. Perform for an audience and earn points for mixing and scratching your music! You can then save your music and share with friends and family! KIDS FIRST!® Adult Jurors say - Young kids gain enjoyment from the simplest of games, whether it be tag or crab racing. Crayola DJ is another one of those easy, fun games that lets children create their own music in the palm of their smart phone device. Perhaps the most enjoyable part is listening to the music change genres so quickly from funk to pop to hip hop just from pressing the devices on the game. Crayola DJ opens up and the player is immediately faced with two turntables. The player is helped by a woman's voice giving basic instructions on how to create music. There are buttons that provide different rhythms, basses, melodies and sound effects to create the player's desired tune. These beats all come from different genres such as dance and holiday. This sort of "practice mode" provides a chance to creatively experiment with balance of the music, tempo and more. There is a two player mode where two kids can compete with one another and show off their mixing skills and also a performance mode where the player gets to feel like he or she is performing for a show. Available on both Android and iOS, Crayola DJ is a very inventive game that many will enjoy. One aspect of the game that I really enjoyed was the interactive aspect. Lots of games out there that kids play are very singularly noted and simply require button pressing or aiming at a target. This game is much more intricate than that and provides children an opportunity to actually learn while playing on a device. One criticism I have of the game is the lack of clarity. Yes, it is good to have kids learn for themselves and creatively experiment with a game. However, I had trouble understanding how exactly to make music and how to get from the "practice" area to the "performance" area. The woman's voice who helps guide you through the game is pleasant enough, but she lacks information on how to make the game really easy to comprehend in the beginning. KIDS FIRST!® Kid Jurors say - The Crayola DJ app is very fun, especially if you love music and creating music. This app helps you to make a song then spin your track at a party like a real DJ. The app is easy to learn, do and is fun to create with your friends. There is not a super wide selection of music beats to make your song but you can make a lot of tunes. I enjoyed the bright visuals, easy to follow instructions, the creativity of the app and the idea of being able to be a DJ on your tablet. I recommend this app for 6- to 12-year-olds because it's fun to create songs and it is a blast to listen to what you create. I'd rate this app 4 out of 5 stars. Crayola DJ is for kids to have fun and be creative. Reviewed by Mia A., KIDS FIRST! Film Critic, age 11. The app Crayola DJ is neat and fun to play with. This is a kid's app where you can learn basic beats. There are so many combinations of music beats that you can make. The music areas covered are pop, hip-hop, dance, fusion and holiday. I thought the holiday beats would be weird to use, but it sounds real interesting. There are some loop buttons that you can add to the sound. Crayola DJ is about complete creativity. The Crayola DJ app does not disappoint. I downloaded this app under Google Play. The screen for this looks very simple. There is a voice tutorial which walks you through the app. I like that is has two turntables that you can actually spin backwards or frontwards. There is also a tempo slide and turntable slide. Crayola DJ has a one and two-player game. This game is based on creating and mixing up beats to earn the most points. It is interesting to play, but I didn't like that the screen was completely different from the main one. It has a voice tutorial also. I read online that you can add your own music. I have not seen anywhere on this app that shows where to do this. That would really bring this app straight to the top. Crayola DJ is fun for all ages. I recommend downloading this app especially for kids who has an interest in mixing. I give this 5 out of 5 stars and recommend it to ages 8 to 18. KIDS FIRST!® Adult Jurors say - The iPad app Kazaz! combines story, animation and factual information. The opening screen presents a planet with various islands to explore. The islands pop up links to a story with illustrations accompanying a voice narration. As you revisit the story, animations and "gems" appear on the illustrations that link to informational videos relating to the topic of the story. This is a good learning tool for ages 5 to 8. The narration is very interesting, engaging and helps kids to read along. The music is good and, after all the stories are developed, it should be a good app for this age group. /The stories are perhaps a bit too long for kids in the younger part of this age group. But, they have simple words and concepts that are age-appropriate. And, the stories model positive behaviors. They are also constructed well and encourage you to continue reading to find out what happens at the end. A page turner! The app is very easy to navigate and to listen to the stories and the music. The sounds and visual quality are great. The sound effects for the instruments are quite good. The app seems to be in the beginning stages so all the stories are not yet developed. Those that are show good sound and picture quality. I could not find a way to start from where I left off and that was disappointing. The entertainment value of the music and the music man are good. The children can learn about different instruments when using this app. I was able to view only one story, the namesake of the app. All other content is available for purchase or says "coming soon." This app stands out from other story apps because as you revisit the story, animations and "gems" appear on the illustrations that link to informational videos relating to the topic of the story. These animations and gems are not only fun to discover, but the level of information presented is accessible to the target audience. I enjoyed exploring the one story that is available because the graphics are visually appealing and the element of surprise made me want to come back for more. KIDS FIRST!® Kid Jurors say - This is a fun and educational app that will encourage young kids to learn about reading and the world around them. This app has a core of education and learning with a sprinkle of fun adventure and a little humor. It is a series of audio picture books that all talk about different characters in this world called Kazaz. Personally, I thought that the app was a bit limited. The GUI is very complicated with no instructions or guidance and I could only get one book for free. The rest, which was only around two, are $2.99 each. As far as the books go, they are fun. However I really felt like the books could concentrate on more educational things. The free book that I read was mostly about the creation of Kazaz, the planet. In my opinion, it would be more educational if instead it provides a story about how Earth formed and evolved. Kids would be very curious about that! My favorite feature is how you find the stories. There is a map of the planet and you click on certain areas to get the books instead of going into a folder and choosing one. I think that is a nice touch. I recommend this app for ages 2-5. It is definitely meant for younger kids. I also give it 3.5 out of 5 stars for some disappointing features. But, it is a very smart and civic minded idea which, with some enhancement, can become a very popular product for early education. Description - Happy Birthday, Clifford! 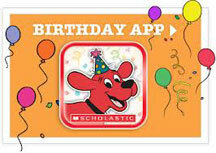 Watch as Clifford arrives and the party gets started revealing three exciting and highly interactive party games that teach essential literacy skills, including one that brings Clifford and his friends right to you through augmented reality. KIDS FIRST!® Adult Jurors say - This is a cute app that has a variety of components from word games to matching games. The background music could be annoying but thankfully can easily be turned off. It introduces simple words and concepts, allows you to create a "party" by identifying objects for that party. It is easy to install and easy to use. You just press buttons. KIDS FIRST!® Kid Jurors say - Kids enjoyed this although the older ones, age 8, said their friends would not like it. Younger ones, age 6) said their friends would enjoy it. It is easy to navigate, the characters treat one another respectfully. Older kids thought they didn't learn anything, younger ones found it somewhat challenging. Their favorite part with the song, "Shout and Cheer Your Friends are Here." They could not stop singing this song. KIDS FIRST!® Adult Jurors say - This app provides a different spin on the "monster under the bed" theme. The parents approach the issue jokingly, but are effective at teaching that there aren't any monsters under the bed. Uses humor in a different way by exaggerating in the story to show there are no monsters, any more than there is a parent who can turn into a Robo Defender. The matching game to each short chapter is entertaining. Not for children under 5, who will not understand the humor. Younger children might find the adults to be creepy and scary. Games were not challenging enough for kids over age 8, so the age range for scary versus challenging is a bit small. Still, as a short, fun, easy to use app, it will hold the attention of kids interested in this genre. KIDS FIRST!® Kid Jurors say - Most of the games are simple to operate, though a few kids have trouble maneuvering the rat maze at first. "It was funny! The parents were funny when they try to trick the kids." "It was cool when the dad turned into Robo Defender." "It shows that there are no monsters under the bed, just like there is no Monster Button." The kids laughed and agreed that it was funny. At first some kids thought that the parents were mean because the kids seemed afraid of monsters at first, but later realize that it was a joke. "It would not be good for kids under 4." Description - Embark on an amazing journey with Ansel and Clair, and explore three African American interactive locales: Nile Valley, Sahara Desert and Serengeti Plains. Each place has animals, plants, places and landmarks to explore. KIDS FIRST!® Adult Jurors say - An engaging and educational program filled with interesting facts and an amusing adventure through Africa. Suitable for younger children and engaging enough for middle elementary-aged kids though some kids ages 10 and up may want more challenge and stimulation. Extra puzzles and in-depth information on some of the subjects keep you looking for more. Though kids may be disappointed that there aren't more games or interactive possibilities, this app is a great benefit in an educational setting and has special appeal to kids with an interest in geography or culture. Could grow into a fun educational app series. KIDS FIRST!® Kid Jurors say - "Easy and fun, one of the best geography games I've played online." "Very realistic, I like learning about different things in Africa." The kids learn interesting things and, for the most part, want to play it again. "I like the space characters from the make believe planet." Interactive and fun, but also educational. They like it very much, but want more games. Description - Follow Nemo's underwater adventure, solve jigsaw puzzles and collect fish tank treasures along the way. Features authentic sounds and sea-worthy images based on the Disney/Pixar movie. 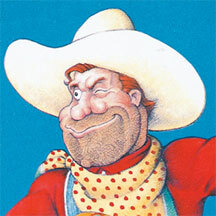 KIDS FIRST!® Adult Jurors say - A simplified story about a popular character. 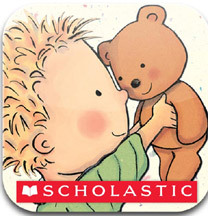 Young children will enjoy having the story read to them, either by an adult or by the voice on the app. Parents can also record their own voice, so when their kids listen they will hear the familiarity of mom or dad. Early readers can read along or record their voices as well. The puzzles are extremely simple to do. All of the features are easy to use, but it took an 8-year old to figure out how to make the recording feature work right. Instead of hitting "record" and recording the story, you have to return to the main menu after each page and ask it again to record. Older kids will get bored quickly, as the story is short and there isn't a lot to do with it, but it is just right in it's ease of use (other than the record feature) and simplicity for toddlers. A great line up addition to keep the little ones engaged on long car trips. KIDS FIRST!® Kid Jurors say - Finding Nemo is about a fish that gets lost in a fish tank with other fish and his dad tries to find him. This app gives you two choices. You can listen to the story being read or you can read it yourself and record yourself reading it. It offers the opportunity for active viewing by doing things such a finding things for your fish tank and working puzzles. It is a bit difficult to do the recording feature, because between every page you have to go back to the recording set up. I liked the record function best because you record your voice and listen to it. It is best suited for ages 2-6, because the story appeals to the younger kids and the puzzles are perfect for this age as well. They are extremely easy. Those preschoolers will enjoy both the puzzles and the story. Description - Based on the hit PBS KIDS TV series DINOSAUR TRAIN, this app promotes science and math skills for pre-schoolers while guiding children through three prehistoric eras and various exciting games including a Dinosaur egg hunt. KIDS FIRST!® Adult Jurors say - The content is great. Most kids like dinosaurs and will appreciate how it ties in to the Dinosaur Train TV show. The game provides facts about different kinds of dinosaurs and helps kids with thinking, matching and pattern recognition skills. Sparks an interest in dinosaurs, revealing facts like how baby dinosaurs hatch from eggs and helping kids to notice the features of different kinds of dinosaurs. KIDS FIRST!® Kid Jurors say - The kids really liked the app. Their favorite parts were getting the mystery eggs, seeing the babies hatch, matching the egg with it's mother and painting the dinosaurs with the 'touch paintbrush.' They loved seeing the different kinds of dinosaurs and learning what an "era" is. Kids exclaimed happily and laughed when they saw the babies hatch. Description - iPhone, iPod, iPad storybook app. Told by John Cleese, illustrated by Tim Gabor an music by Elvis Costello. KIDS FIRST!® Adult Jurors say - A cute story, particularly appealing to elementary aged boys. Superior visual aspects, bright vivid colors and pictures. Too complicated for early readers to read along, but the story will appeal to them. Kids can record their voices and hear themselves telling the story, but this feature will not work on an iPod if you don't have a microphone. Music was excellent and enjoyable for both kids and adults. KIDS FIRST!® Kid Jurors say - The story is interesting and kept the attention of an active eight-year-old. "The graphics and characters are awesome." "It's cool because they talk about King Arthur and the Knights of the Round Table. I knew a lot of the characters and really liked the story." Description - The story of the Velveteen Rabbit as told by Meryl Streep, Illustrated by Dave Jorgenson and music by George Winston. KIDS FIRST!® Adult Jurors say - This is an outstanding phone app. I think it will appeal to kids and adults. It's the sort of thing that works well on phones and kids can watch when riding in a car, waiting in a restaurant or for an appointment of some sort. It's short, sweet and to the point. KIDS FIRST!® Kid Jurors say - Kids who love stories enjoy this iconographic representation of Velveteen Rabbit. Even though there is limited action, it's especially enjoyable as a short story on a phone and all the kids were engaged and entertained. Description - The story of Pecos Bill as told by Robin Williams, illustrated by Tim Raglin and music by Ry Cooder. Plays on iPhone, iPad and iPod. Three methods of storytelling; children can choose to be read to, can read to themselves or they can record their voice and play back with the story. KIDS FIRST!® Adult Jurors say - We loved this app. My nine-year-old grandson was thoroughly engaged. Even my 15-year-old grandson enjoyed it. They liked that they could watch the short video or read the book. Robin Williams is his usual crazy hilarious self. KIDS FIRST!® Kid Jurors say - "Loved it, very easy to use." My eight-year-old was mesmerized. I'm not sure he understood all of Robin Williams' craziness, but he liked it all anyway. The story was familiar to him, yet had fun little spins he had not seen before. Description - The story of Johnny Appleseed told by Garrison Keillor, illustrated by Stan Olson and music by Mark O'Connor. For use on iPhone, iPad or iPod. Includes three options of storytelling. Children can listen, read out loud, or record their voice to play back with the story. KIDS FIRST!® Adult Jurors say - Shows good behavior rewarded simply. Very well done. Soothing and a good bedtime story. 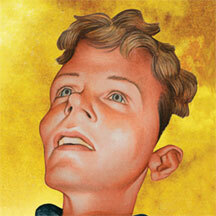 The story of Johnny Appleseed, a simple man who only lives to do good. Fun to watch, nice visuals. KIDS FIRST!® Kid Jurors say - It was calming and uplifting. "We loved the old-fashioned style of the story. Johnny wore a pot on his head and looked funny, but people treated him nicely and were grateful for the apples. He was kind to all living things and made people think about taking responsibility for the world around them." Description - The story of John Henry as told by Denzel Washington, illustrated by Barry Jackson and music by BB King. KIDS FIRST!® Adult Jurors say - Wonderful phone app based on the classic children's book and the original Rabbit Ears videos. I enjoyed the familiarity of Denzel Washington's voice. The illustrations are wonderful. The story, though quite unbelievable, is a fable which tells the story of how machines pushed men out of the job of laying railroad tracks. It has a nice moral in that although a machine might outlast a man, it doesn't necessarily do a better job and there is some sort of soul and feeling put into human effort that is missing with machines. John Henry dies, as he does in the original story, and it's a sad ending to the story. KIDS FIRST!® Kid Jurors say - "I really like it. It's a great way to enjoy reading the book or watching the video." Even my 15-year-old liked it. My eight-year-old recognized BB King. He really liked the song and sang along each time. KIDS FIRST!® Adult Jurors say - An easy story for toddlers to enjoy and early readers to read aloud. You can have it read to you or shut off the narration and read it yourself. 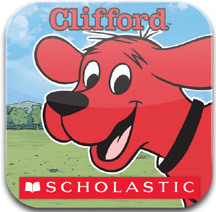 Everyone loves the Big Red Dog, and the Clifford app is sure to keep young ones engaged. Only a few simple words on each page and some pages have special effects when you press or tilt the screen. There is a simple tilt game at the end which will keep children busy a little longer on this app. KIDS FIRST!® Kid Jurors say - The tilt game is fun. You get to collect bones until you score ten points. It's easy to do for young kids. You turn into different things - a helicopter, plane, car, etc - while you move to collect your bones and earn points. Description - Focuses on "emotional play" - encouraging children to understand the moods, sentiments and emotions that bring characters to life. 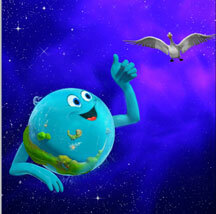 "Touch and Tilt" animated interactions make it easy for children to engage with the story. KIDS FIRST!® Adult Jurors say - A very simple app. You have the choice of having the story read to you, or you can turn off narration and read it to your child (or let an older child read it.) The story has simple colorful drawings and is easy for young children to understand. Kids will love tilting the iPhone or iPad to add basic motion, animation, to the characters - mostly swaying back and forth, and in one case making the boy run. There are no special features, which also makes this just right for toddlers. KIDS FIRST!® Kid Jurors say - Kids loved the tilt feature and the familiar characters. They liked to record their voice and hear it back. "Clifford has to collect bones, it's fun to get the bones." KIDS FIRST!® Adult Jurors say - A very simple app, easy to use and minimal words to read. Will acquaint pre-readers with a handful of words and give them simple puzzles to solve. Puzzles are simple enough for even younger children and parents can help them move through the screens. Kids can choose to read or be read to. KIDS FIRST!® Kid Jurors say - This app might help little kids learn to read some words. Winnie the Pooh is someone everybody likes and I like the puzzles.